- the inside plastic layer is having an in-built plastic neck and a plastic cap with induction sealing wad for on line sealing of the can to prevent pilferage and adulteration. We are engaged in manufacturing packaging products which provide efficient protection to tools and components shafts, gears and offers a long service life. 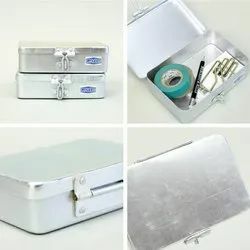 We have been in this industry a long time and would like to offer our services to who ever wishes to set up a plant in this exciting field of Metal Packaging. We have very good relations with all the machinery manufacturers and wide range of help and support can be made available. Specialized Coatings and inks used fpr protection and decoration of metal containers, beverage canes, food packaging, industrial packaging etc. We have with us a vast gamut of Metal Cans For Paints that are available in a variety of sizes, shape and other specifications. Our range of cans are specially designed to be used for storing different types of liquid such as paints etc, that need to be stored in such a way that they may not come in contact with the atmosphere.